Termites are perhaps the most annoying pests out there and if left unchecked they can do serious damage to your home. If you see even one termite, you should do what you can to get rid of them immediately on your own. It is important to understand that there is no such thing as just “one termite”. Termites have a social structure similar to ants, they live in colonies, if you find one then there are certainly more of them around. There are several different products that you can use to handle minor infestations. 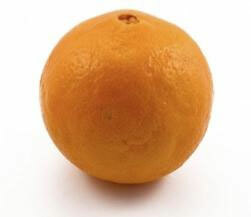 Termite bait is an excellent home termite treatment choice. Termite bait is designed to kill off the entire colony and is a relatively recent development in termite control. Termite bait does not kill a termite right away, it is a slow acting poison that is designed to have a slow, but definite effect. Termite bait will spread through a colony pretty quickly because termites often feed and groom each other. When termites take the bait they gradually spread it throughout the entire colony. The oldest kind of termite treatment method is liquid pesticide. Pesticides designed specifically for termites are also called “termiticides”. The liquid system no longer seems to be the preferred way to deal with termites, but it is a rather quick way of eliminating them. Many of the liquid treatments are dangerous to use for people who are not trained on how to use them properly, but there are options for the non-professional person. It is important to understand how the chemical you are using should be used, how much to use, and to take any recommended safety precautions. 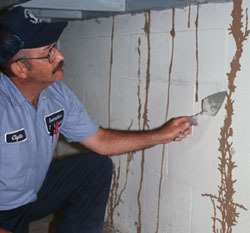 Usually chemical treatments are used by professional termite exterminators and not as a do it yourself termite treatment. 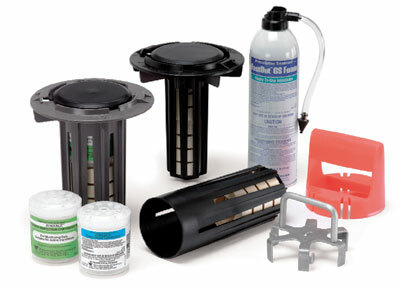 There are a variety of liquid sprays, foams, and repellent chemicals available for do-it-yourself termite control. A combination of a termiticide and termite bait is probably the most efficient way to get rid of minor infestations. 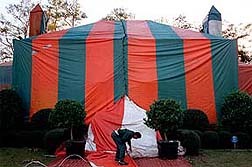 Fumigation is also another viable option for termite control. A fumigation treatment will not totally eliminate colonies but it is a good way to keep the infestation from spreading until you develop a more permanent solution. 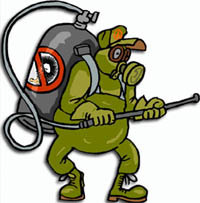 Depending on the fumigation agent used, you may need to evacuate the building for several hours to avoid the health problems that may be associated with inhalation of the fumes. Termite stakes are an effective way to monitor termite activity, and possibly prevent an infestation in the first place. Termite stakes are placed in the ground outside of your house and have wood/cardboard or some other termite food source located inside as well as a pesticide. If the food source is being eaten, this is a strong indicator that termites are around and the pesticide will help to keep them under control. Termite stakes are a great preventative tool, but if your home is already infested they already have a food source and are unlikely to go outside in order to obtain food from the stake. When using any of the above do it yourself termite extermination methods you need to understand the dangers of any product you decide to use, and how to use them safely and effectively. If you have exhausted all of the above methods but have not managed to eliminate the infestation, there is little else you can do but call in a professional exterminator.